Is there anything better on a hot summer day than a big bowl of homemade ice cream? My Grandma Faye always had ice cream churning in her large wooden old-fashioned ice cream maker. We loved getting up on a stool and assisting her by adding large pieces of ice and rock salt, hoping that we would get the coveted role as the “taste tester.” We would take our big bowls of ice cream, sit outside with our feet dangling in the sparkling pool and think that being at Grandma’s house was the best. 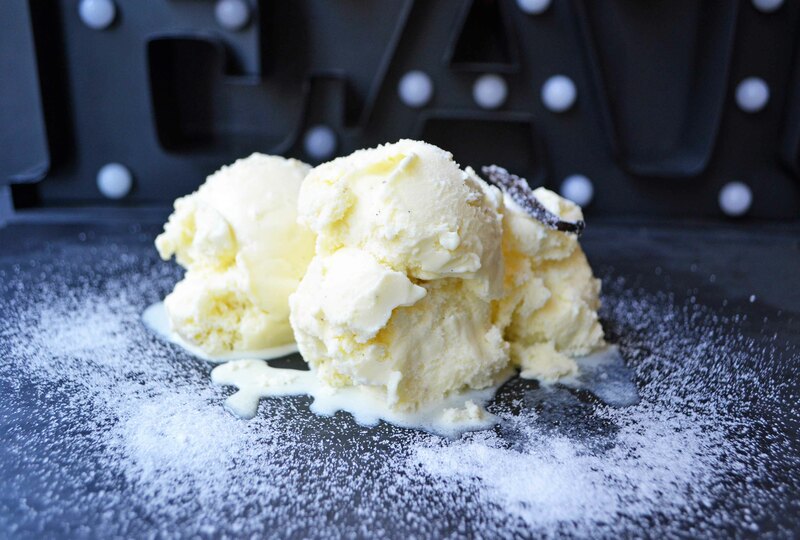 I believed it then and I still believe it now…there’s nothing better than handcrafted, rich, sweet cream vanilla ice cream made from scratch, using only the freshest ingredients. We are talking ultra simple ingredients – heavy cream, whole milk, sugar, vanilla beans, and sometimes even egg yolks. That’s it. There’s no fillers or extras added. It’s how ice cream should be made. 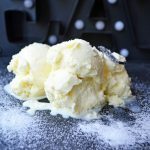 I am sharing TWO homemade vanilla bean ice cream recipes with you today that will rock your world. It’s a serious bonus. I am giving you two options – a simple one using only cream, milk, sugar and vanilla and one that is a custard base using egg yolks, and is slightly more time consuming. My kids favorite is the simple one which is a win-win for me. You have never tasted vanilla ice cream like this out of the carton. Use fresh cream. I mean, the good stuff. Don’t even both looking at the fat grams on the label. It’s ice cream and we are going to enjoy every single bite. If ice cream calls for milk, use whole milk every single time. It has that extra amount of fat that lends itself to a creamier ice cream. If you make the vanilla bean ice cream custard using fresh egg yolks, it has to be cooked and is more time-consuming. The mixture is brought to 185 degrees, which means that it needs to be chilled before attempting to freeze it. The results are mind-blowing good but it does take more time and effort. Vanilla Beans make all of the difference. They are ridiculously expensive but if you can splurge on one thing, I would say buy 1 vanilla bean. 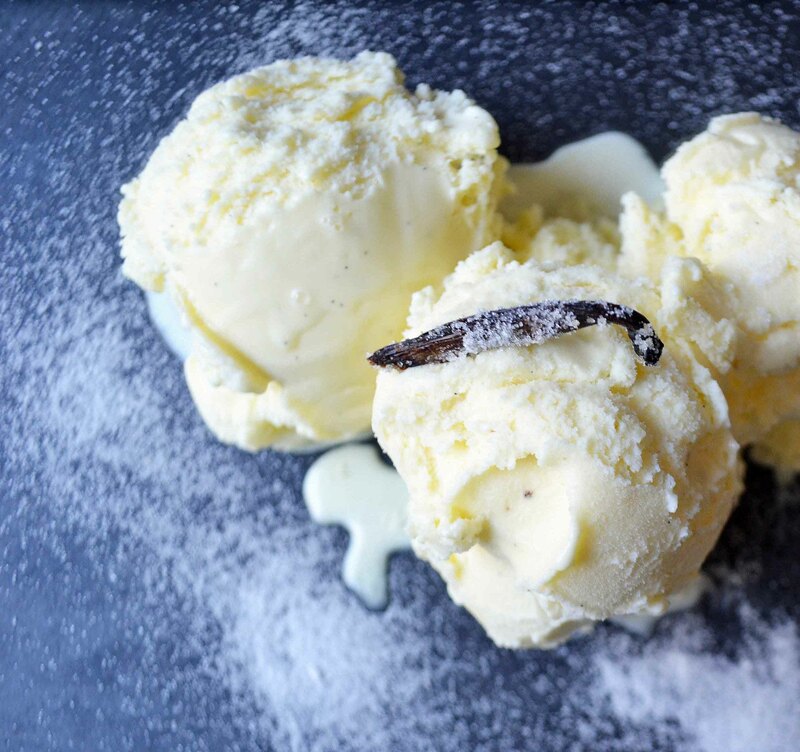 There’s nothing like specks of real vanilla beans in ice cream to put ice cream over the top. You can always substitute pure vanilla extract or vanilla paste as well. Remember to always add it after cooking to ensure best flavor pay off. There are many ice cream freezer options out there. There is the old-fashioned kind like this one HERE that calls for a lot of ice and rock salt. It can taste incredible but keep in mind that it may take longer than other options. 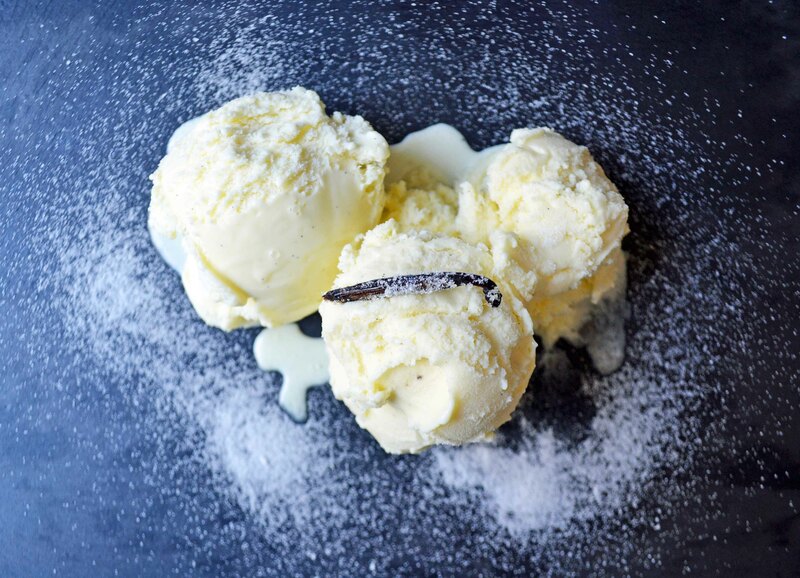 Our favorite way to make this homemade vanilla bean ice cream is to use the Cuisinart Ice Cream Maker. There are a few models available and sometimes you can even score one on sale at Costco. We have the model where you keep the ice cream freezer bowl frozen at all times, add the cold ice cream mixture to the bowl, and the machine freezes in less than 20 minutes. No mess. No rock salt. No ice. Instead of making ice cream once or twice a year with the Big Daddy old-fashioned ice cream maker, I am making it all of the time. Shoot, maybe that’s a problem. 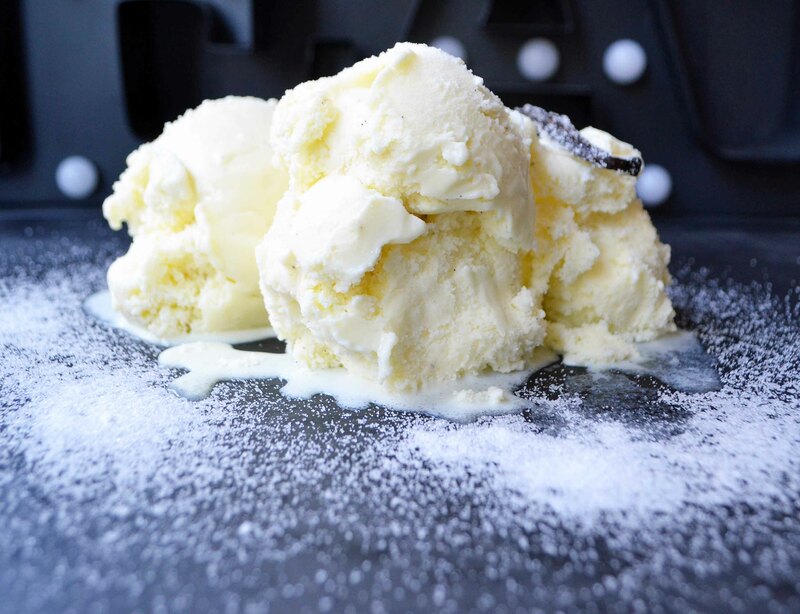 Two recipe options for perfect Homemade Vanilla Bean Ice Cream. Combine the cream, whole milk, and vanilla beans into the medium pot. Start to heat mixture over low heat. Whisk the sugar and egg yolks together in a small bowl until fully combined. When the cream mixture reaches 95 degrees or feels warm to the touch, remove from the heat. Carefully, add 1/4 of the cream mixture into the yolks, whisking constantly until blended. Do not add all of the cream mixture at once to the eggs. You want to slowly add heated cream a little at a time to temper the yolks. Whisk the tempered yolks into remaining warmed cream mixture. Return pot to medium-low heat. Cook the ice cream base over medium low heat until it reaches 185 degrees or is thick enough to coat the back of a spoon. Remove from heat. 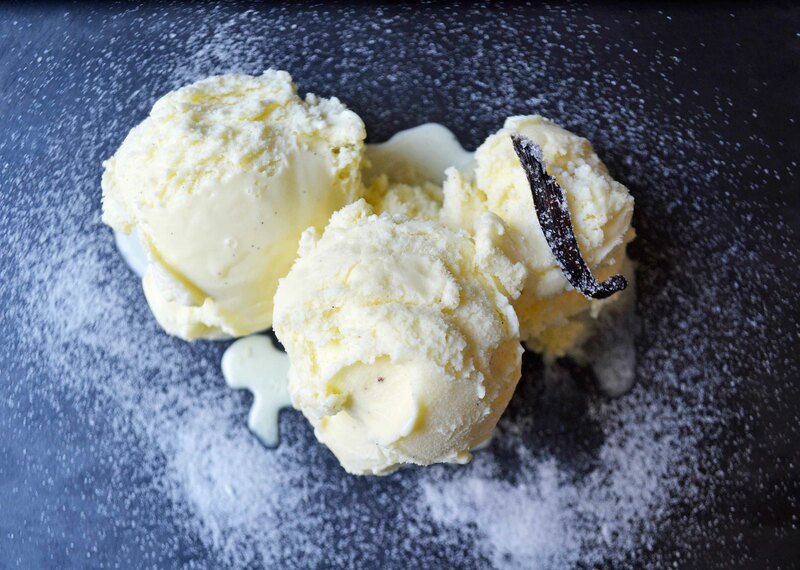 Remove vanilla bean pods and scrape vanilla beans into ice cream or add pure vanilla extract. Pour ice cream mixture into a bowl to cool. Fill a large bowl with ice. Place the container of ice cream in the ice bath. Stir often and let cool. When the ice cream base has cooled, pour into ice cream machine and churn according to manufacture's instructions. When finished churning, transfer to airtight container. Allow ice cream to harden in the freezer for 30 minutes to 1 hour. Combine cream, half-n-half, and sugar in medium saucepan. Cook over medium low heat, stirring often. Cook until sugar is dissolved, about 2-3 minutes. Remove from heat and add vanilla bean, vanilla bean paste, or pure vanilla extract to taste. Let chill for 30 minutes before placing in ice cream maker. When finished churning, transfer to airtight container. Allow ice cream to harden in the freezer for at least 1-4 hours. Once you have perfected the Homemade Vanilla Bean Ice Cream base then you can add any topping your little heart desires. Mix-in Ideas: Strawberries, Bananas, Raspberries, Blackberries, White Chocolate, Salted Caramel, Chocolate Chunks, Oreos, Candy Bars. Wait until I unveil what is coming tomorrow….MJ’s Chocolate Chip Cookies that LOVE to be paired with this ice cream more than anything else. Modern Honey is bringing you the ultimate ice cream sandwich. Giddy up. Thanks for the recipes. I have to say I have tried a few different ice cream flavors, but vanilla bean continues to be everyone’s favorite in our house. This summer I have kept my Cuisinart base in the freezer- ready for homemade ice cream. Can’t wait to see your ice cream sandwiches (those are my favorite!) Have a wonderful day. Hi, on your recipe, it says to add the milk, cream, and vanilla. Adding vanilla is on step 2 and step 6. Which is the appropriate time to add? Please read again. The WHOLE pods go in on step 2 and later in step 6, you remove them, scrape the seeds out and add the seeds only back to the ice cream. Of the dozens of vanilla ice cream recipes we have tried, these are the BEST. Modern Honey rocks! Thanks Mimi for clarifying and helping out Ashley! I appreciate it. Also, thank you for your great support! What volume of ice cream does the recipe with eggs make? I am trying to make a gallon but can do the math if you give me original volume (rather than “setvings” because my idea of a serving is usually pretty darned generous!). Thanks! I thought the mix would curdle above 180. I hold the mix at 170-175 for fifteen minutes by turning off and back on the simmering water while monitoring with an instant read thermometer and whisking. Using half light brown sugar and half white is nice. Toasted walnut, vanilla bean, strawberry and amaretto is a winning combination! Oops, forgot to add..try the ratio of two cups heavy cream to one cup whole milk and four extra large or five regular egg yolks, and add a small container (single serving, or more to taste) of high protein yogurt to the chilled mix before churning. I believe the proteins help modify the iciness, making for a smoother mouthfeel. Some ppl recommend nonfat dry milk powder for that, but others say it contains oxidized cholesterol which is allegedly bad, so, use your own judgment. I’ve started adding the high protein yogurt, I like it. Alcohols will of course lower the freezing point and make the ice cream softer, so don’t go overboard or you’ll be serving a shake! Dried fruits like cranberries really need softening by precooking in a warm liquid or preferably softened in an alcohol and might turn out like hard rocks when frozen, so try to stick with fresh fruits or semi/half dried fruits. My daughter and I just made the simple version of the vanilla bean recipe. We added a cinnamon stick while it was warming. Only difference from the listed recipe. This is the best tasting ice cream recipe ever. I have been making homemade ice cream forever and this tops them all. I cannot believe how good this simple recipe is!! I’ve never been a huge homemade ice cream fan. In the past it was always so watery and not very creamy. Decided to give it one more try and made this for Father’s Day yesterday. Wow! Seriously the best ice cream ever. It was so creamy and had so much flavor. My only complaint is I wish we had more !! Can I make two batches of ice cream using the cuisinart? Hi Cristina! I usually find that one batch fills it about 2/3 full so it may not all fit if you double it. You can always double it and try to make it work! Good luck! Thoughts on adding either coconut shreds or essences, to create vanilla & coconut ocean? Lovely recipe, thank you! Just wondering if anyone has a tip re a softer freeze – alcohol works but am making for kids thus want super soft, easy to scoop. Is there a way to mix Ice cream by hand if you don’t have the machine and can’t afford one? Considering an old-fashioned bucket icecream maker is basically a bowl in a much larger bowl filled with ice and salt (which lowers the temperature further than plain ice), you could essentially create your own and just whisk it continuously. It would take a while, but it should work. People also do the same with plastic bags filled with ice/salt and putting their base inside within its own bag and proceed to shake the bag till the base freezes.